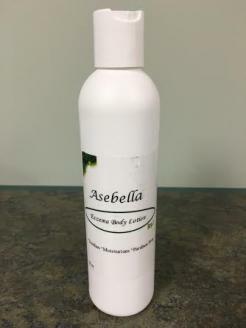 The Asebella Eczema Body Lotion helps restore the softness to dry or skin affected by Eczema. This unique lotion both hydrates and lubricates the skin. Humectants like Hyaluronic Acid are used to help the cells retain and gain needed moisture thru out the day. Safe for babies 1 month and older. Doctor recommended and approved. 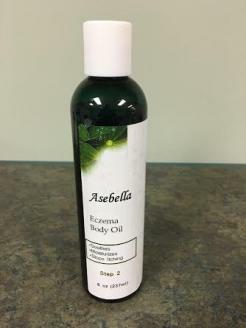 The Asebella Eczema Body Oil penetrates deeply into the skin bringing immediate relief to dry, cracked or itchy skin. Its fragrance and hormone free formula gently lubricates and hydrates the skin. This is the family size and will last most users for many months. 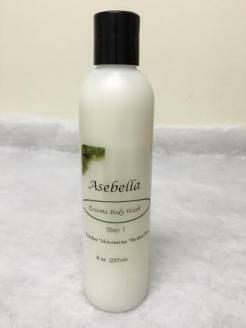 The Asebella Eczema Wash gently bathes your skin and helps keep the proper moisture balance in the skin. 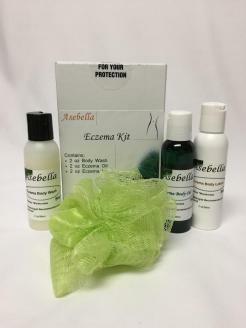 * Features 3 unique products that work in unison to help control eczxema. * Extremely mild and safe to use on infants 1 month or older. * Free of parabens and harsh ingredients. * Drug and Steroid Free products.